The Gunslinger Corral , Universal Backpack Attachment is a handy little strap that work's with the Gunslinger Corral , compact rifle shotgun holster's. 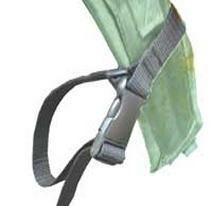 You simply attach it to your back pack's shoulder harness for ultimate stability. Don't let it fool you, You'll have very rapid access to your gun! 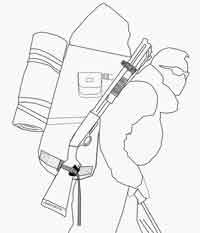 This method is used with a daypack or small frame pack. Mount your holster at your side -as shown below. 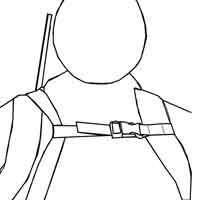 Attach the Gunslinger Corral , Universal Backpack Attachment to your sling, drawing it toward the center of your chest. 1. With one hand, remove the rifle stock from your holster. 2. 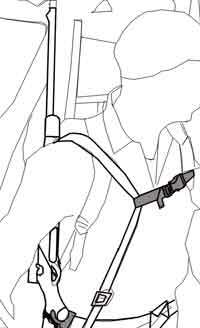 Reach over your "sling" & "backpack attachment" with your left hand on lower receiver. 3. 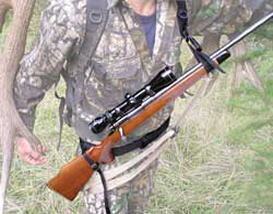 Your rifle sling should slide freely through the backpack attachments loop. The buckle does not need to be released for rapid draw. 1. Mount your holster toward the front (above your pocket). If you are really going on Safari with a large backpack, you may want to try the following. As shown above, Holster mounted to belt mounted to pack. 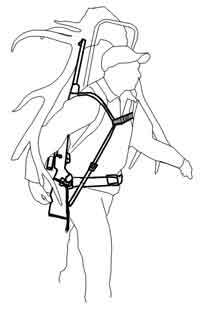 Universal backpack attachment mounted to upper portion of shoulder harness.